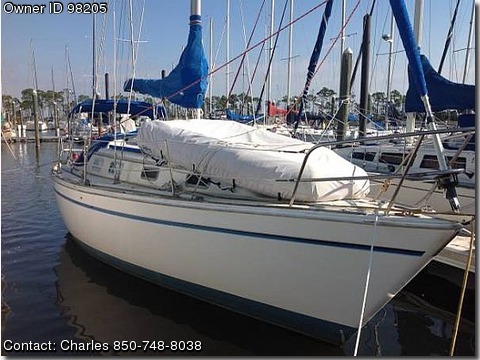 Boat is locatd in Navarre,Florida.Please contact the owner directly @ 850-748-eight zero three eight…1985 Pearson 303 Sailboat as is, great family cruiser or live aboard for the adventuresome couple. Boat can be seen by appointment only. Contact Charles by phone, text or e-mail, 850-748-8038. PayPal scammers please do not contact, I will report fraudulent activity. Type vessel: Molded fiberglass, sloop rigged sailing vessel, with diesel auxiliary propulsion. Internal Ballast approximately 3,500 lbs. Last surveyed on February 23rd, 2010, by Bayshore Marine Surveyors. New 7/16 Red and white jib sheets installed 2012. Aluminum adjustable Mount for 12 HP outboard on transom.